If you entertained any doubt that a trait such as musical ability is contained a person’s DNA or “runs in the family” this should convince you otherwise. A query sent to the Derry Area Historical Society’s family research library from a “fan” of Sarah Armstrong led to our rediscovery of Derry’s most prolific song writer of the past and to the recognition that her musical talent lives on in members of the Gray Family. Photo 1 – Another Gray Family of musicians was headed by Davis Gray (seated with violin) with his daughters and sons, first-cousins of Sarah Gray Armstrong. Miss Sarah Elizabeth Gray was born in Gray Station in Derry Township, Westmoreland County, PA, on March 18, 1883. Her father was Charles H. Gray, a grandson of Israel and Rebecca Gray, the Ulster-Irish immigrant ancestors of the Gray family of that place. 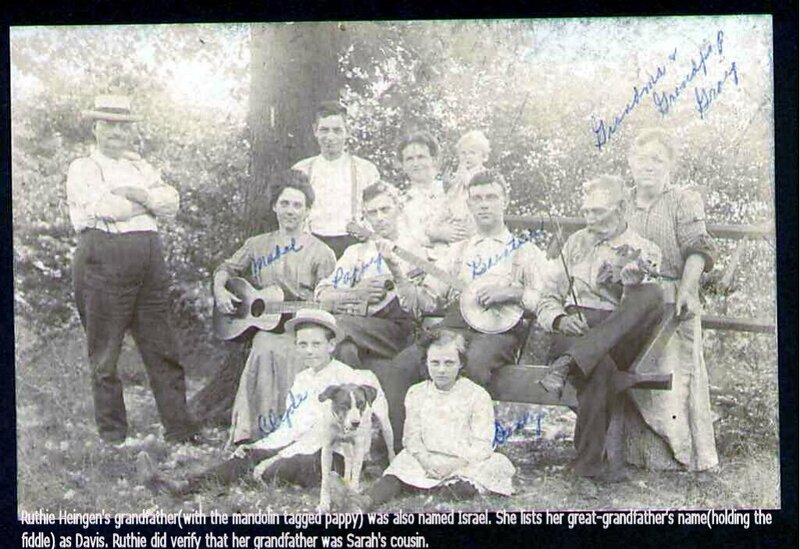 Like her father and his brothers, Sarah was very talented musically and can be credited with memorializing the traditional folk music that her family played in 19th century Derry Township. It was Penn State University professor Dr. Samuel Preston Bayard who captured the Grays’ music in his 1944 work, Hill Country Tunes – Instrumental Folk Music of Southwestern Pennsylvania. Bayard wrote, “(the Grays) absorbed and preserved the local tradition in which they grew up.” (1) Bayard’s interview of the 60-year old housewife, Mrs. Sadie Armstrong, at her Kingston Cutoff home, resulted in the recording, on paper, of a large number of songs played by Sadie and other members of the Gray family, the major contribution to his book. In his “Notes on the Players” Bayard wrote, “In the previous generation of the family were five brothers: Charley (Mrs. Armstrong’s father), Laney, Dan, Joss (Joshua) and Abe, all skillful on some instrument, and accustomed to playing together for dances.” Bayard continued, “All of these men are now gone, and Mrs. Armstrong, who began playing at the age of five, is the sole legatee of their melodic treasure. As a young girl she used to listen by the hour to her uncle Laney – the most expert fiddler of the group, and the one possessing the largest repertory of tunes – absorbing his music and learning to play it herself. 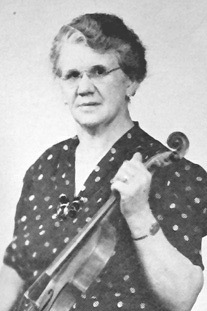 She also use to play cello, on which she would help the group out when they were playing in the pavllion at ‘Kist’s Grove’ (a dancing ground on the outskirts of Derry), and elsewhere in the neighborhood.” About 1910 Laney Gray went to live in the Far West and the “Gray Boys” ensemble broke up, although they individually continued to play for dances throughout the area. Sarah, who married Charles Armstrong in 1899, “with the assistance of her daughter at the piano and her son on the guitar or banjo, has likewise continued playing the old music, either for dances, or on an occasional radio or theater program” wrote Professor Bayard. If he had done more research in the Derry area – and hung around another 70 years – he would have found that the love of playing music was not limited to the members of the Gray family he listed above. As a result of Dr. Bayard’s transcriptions of traditional American Dance music of the 1800s, fiddlers of today attempt to recreate the techniques and melodies of the past. One song, called “Old Reel” in Bayard’s book is now known as “Sarah Arm-strong’s Tune” after the Derry native who played it for Bayard. This song can be heard on “You Tube” and on recordings such as Todd Clewell’s CD, “Sarah Armstrong’s Tunes” containing 27 of her compositions, and available at www.toddclewell.com/sarah.html. 1 Bayard, Samuel Preston. Hill County Tunes. American Folk Lore Society. Philadelphia. 1944. 2 Thomas, Eleanor. Community Express. Laurel Group Press. Scottdale. 1990. When she died in 1957 at the age of 74, few people near her Kingston cut-off home and throughout the Derry community noted the passing of Mrs. Sarah Armstrong and fewer yet remembered the joy she once brought to the community with her music. No one could have imagined that 50 years after her death, “Sarah Armstrong’s Tune” would be heard throughout the world on You Tube. Sarah Elizabeth Gray, born March 18, 1883, was the oldest child of Charles and Julie Gray of Gray Station, a small village along the Pennsylvania rail line in Derry Township, Westmoreland County. Charles was one of 5 sons of Israel and Sarah Boyer Gray, all born between 1859 and 1867. The five also included Laney, Dan, Joss and Abe. They had an additional 6 older half-brothers and one half-sister, born to Israel and Liza Bush Gray from 1834 to 1853. Large families were common for the Grays of Derry Township. And so was music. Samuel Preston Bayard, of the American Folklore Society, was also a music teacher at Penn State University. Interested in the rich folklore traditions of western Pennsylvania, on November 5, 1943, Bayard found his way to the Derry home of Mrs. Sarah (Gray) Armstrong, at the top of the Kingston Cut-Off. After explaining his interests, Mrs. Armstrong picked up her old fiddle and began to play. Bayard transcribed to paper four tunes that day. He must have been impressed because thirteen days later on November 18 he returned and transcribed thirty-three more tunes! These thirty-seven tunes would make Mrs. Armstrong the principal contributor to his book “Hill Country Tunes” published in 1944. Although Professor Bayard mentions the presence of a “recording apparatus” in the Armstrong home, there are no known recordings of her playing. If any descendants have these recordings, please contact the Derry Area Historical Society. Many of Sarah Armstrong’s tunes have been recorded by a modern-day fiddler, Todd Clewell of Felton, in central Pennsylvania. Todd wrote in the liner notes to his CD, “In June of 2002 I attended an old-time fiddler’s festival in Elk Creek, Virginia. We were jamming on the front porch …. Ellen Vigour played a tune that really caught my ear. She called it “Sarah Armstrong’s Tune”. The name stuck with me and I realized that I actually had a book called “Hill Country Tunes,” with more of Sarah Armstrong’s tunes in it. I learned a few, and then a few more, and before I knew it I was hooked. Over the last two years I have learned and recorded twenty-seven of Sarah Armstrong’s tunes.” “Sarah Armstrong’s Tune”, called “Old Reel” by Sarah herself, along with an additional 24 of her songs, are recorded on Todd’s compact disk, Sarah Armstrong’s Tunes, that can be ordered at: http://www.toddclewell.com/sarah.html or purchased through the Derry Area Historical Society. By Cathi Gerhard in Feature Stories on September 17, 2013 .